Percy Frost was the sixth son (and twelfth child) of James Frost, a gardener, and his wife Sarah née Fidler. At the time of his birth on 23 November 1897 the family were living at 15 Oxford Street, Newbury in the part of town known as Speenhamland. In 1902 tragedy struck the family when Sarah died aged 45. In 1904 they moved to 3 Gilder’s Square, one might think they were in search of more space, but the houses in Gilder’s Square were no more than two-up two-down terraced houses. For a large family like the Frosts life would have been very cramped, even though many of the elder children may have left home there were still eight at home for the 1901 census. By 1911 most of the children had left home, leaving James and his three youngest sons (Montague, Albert and Percy) the only inhabitants of 3 Gilder’s Square. In 1911 Percy was still a schoolboy at St Mary’s School, Speenhamland, but at the age of 13 his schooldays were drawing to an end. Following school he may well have found employment as an errand boy (his brother Albert’s job in 1911) before being taken on as a baker in one of the many Newbury bakeries. In December 1915 the local paper, the Newbury Weekly News, carried a list of local men who had signed up with the forces; Albert’s name appears as a soldier of the Hampshire Regiment. Percy's name is not on the list, although he had signed up on 28 September, aged 17 years 10 months and 5 days (as shown on his service record). Unlike Albert, Percy opted for the navy; though not as a sailor, he joined the Royal Marines. His first real posting was to HMS Penelope, an Arethusa-class light cruiser that was part of the Harwich Force, guarding the eastern approaches to the English Channel. In April 1916, while Percy was on board, HMS Penelope was torpedoed by a German submarine, UB-29, leading to the need for extensive repairs. Percy may well have joined during this period in dock, it is entirely possible that he never actually went to sea once he had completed his training. Perhaps this influenced him to volunteer to serve on land, with the Royal Naval Division - an infantry division made up of marines and sailors. He probably went to France in early 1918, quite possibly his change of pay station from Chatham Division to the Victory V pay office coincided with the move. He was sent to the 1st Battalion Royal Marine Light Infantry on the western front, this was a battalion in the 3rd Marine Brigade, 63rd (Royal Naval) Division. 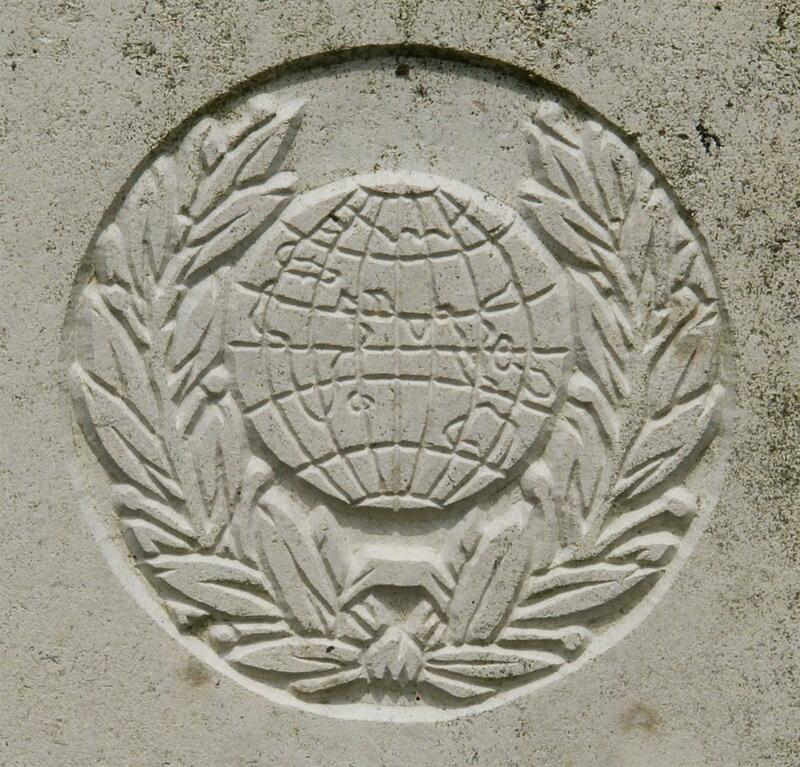 The regimental badge of the Royal Marine Light Infantry, as used on CWGC headstones. Percy was wounded while serving in the Somme section of the front; it is not known exactly when. He died of his wounds at No 3 Casualty Clearing Station at Gezaincourt on 23 August 1918. Death at a clearing station suggests that he received his wounds not long before death; otherwise he would have been moved to a hospital further from the front. His division was involved in the 3rd Battle of Albert, which was launched on 21 August and resulted in the recapture by the Allies of the town of Albert which had been lost to the Germans a few months earlier. This was a period during which war on the Western Front changed from the entrenched stalemate of the past three years into a more mobile form of conflict, not seen since the very early days of the war. On 8 August the Allies assaulted the Germans near Amiens, and soon pushed them back, Albert was the next phase. For three months the Allies pushed the enemy back towards Germany, liberating much of the French and Belgian territory that had been in German hands since August 1914. His death at a CCS on 23 August suggests that Percy was wounded on 21 or 22 August while taking part in this offensive. His wound was reported a a 'gunshot wound in the head' - this should not be taken too literally, the term gunshot wound included wounds inflicted by shrapnel or other flying debris. A communication from the War Office states that Pte Percy Frost, 1st Royal Marines Battalion, 63rd Division (RN), died at the 3rd Casualty Clearing Station, BEF, following ten days after the decease of his father, the late Mr James Frost, of St Bartholomew’s Almshouses. The official notification was that he died on August 23rd from a gunshot wound in the head causing compound fracture. Deceased joined the Navy in September, 1915; having served two years at sea he volunteered for service in France. Before going in the navy he was a baker, and was in the 20th year of his age. 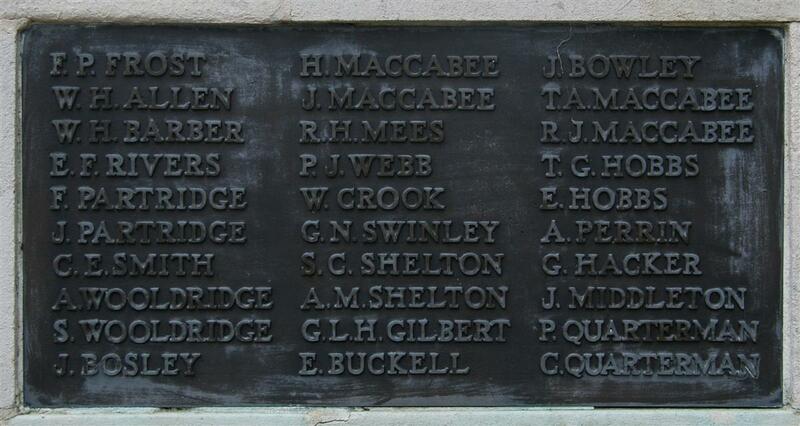 Percy's name on Newbury War Memorial. Percy was buried in France at Bagneux British Cemetery, Gezaincourt, in grave IV.D.4. Francis Percy Frost is remembered on several war memorials, Newbury Town (tablet 2), Speenhamland St Mary’s and Speenhamland School. There is also a Percy Frost on the memorial in Brimpton that may be him; though no obvious connection has been made it is possible one of his many siblings settled in the village and put his name forward for commemoration.